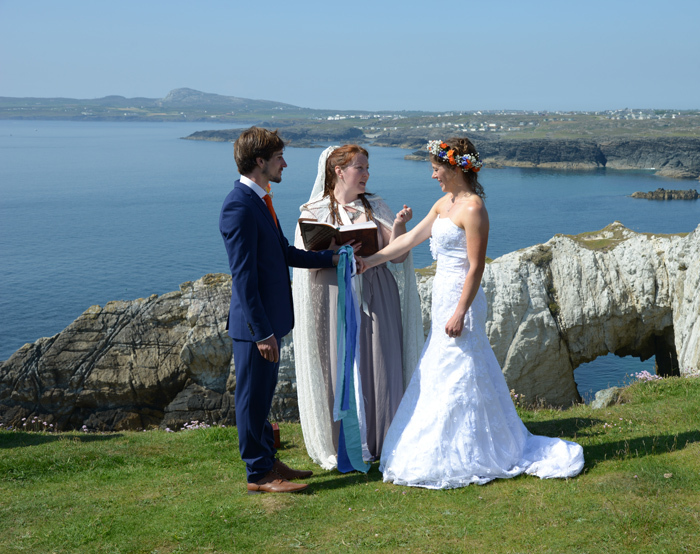 Sophie and Tim were married on a glorious summer's day on the clifftops at Rhoscolyn on Anglesey. Their beautiful handfasting ceremony was conducted by a humanist celebrant and watched by more than a hundred guests. The couple's unique approach to their ceremony and the amazing scenery that surrounded them was the perfect fit with our style of photography. Anglesey is certainly perfect for wedding photography! Handfasting ceremonies like Tim and Sophie's often tend to be humanist in origin, although handfasting is also a tradition in religious ceremonies. The minister carried out a handfasting at the ceremony we photographed at Bangor Cathedral, and you might have spotted something similar at the wedding of Prince Harry and Meghan Markle. Both religious and humanist versions of a handfasting tend to be very much orientated towards the couple, with the celebrant spending time with the couple before the ceremony to get to know them. In the case of this particular handfasting, the couple were able to choose the fabric that resonated closest with them. The handfasting itself involves a complicated knot, so that the couple can untie their hands while leaving the knot in the fabric in place. The couple are then able to keep the fabric as a record of the day and the commitment they made to one another. We decided that a handfasting is a beautiful and profound way to celebrate a marriage. Just remember that you'll need to make a trip to the register office to make it legal! The ceremony also shows just how beautiful Anglesey is...the perfect venue for wedding photography.